Sometimes you need power. Sometimes you just want it. The TRACKER SVX1000 delivers. Add to its 100hp power, best-in-class ground clearance and storage, 2000 lb towing capacity and you have American-built performance to fulfill your passions in the country you love. INSTRUMENTATION: Adjustable Backlit LCD with On-Board Diagnostics, 12V DC Outlet. STORAGE COMPONENTS: Cargo Dump Bed, Extended Cab Storage Space, Glove Box. 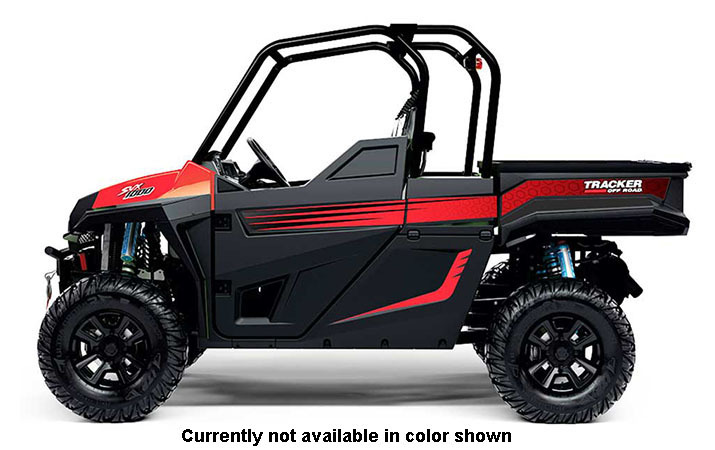 SAFETY: 3-Point Seat Belts (4-Point Ready), Seat Belt Speed Limiting, Standard Full Doors, Steel Tube ROPS, Standard Front Brush Guard, Passenger Grab Handle, Headlights, Brake Light, Customizable Speed Controller. Class-leading 24 cu-ft of storage with extended cab.